The artists want you to get a sneak peak at what you will be seeing during the tour of their home studios on September 23 & 24th. 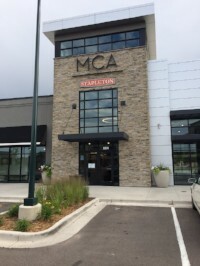 Stop into The Cube (Stapleton's Master Community Association's cultural event center) and pick up your free tour booklet/map. You will also be able to view a sampling of the art from some of the 28 artists participating in this year's Open Studios Tour. Artist Rebecca Tomlin getting her sculpture ready. 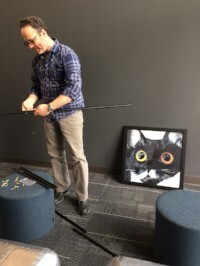 Artist Bret Thayer putting together the easel as "Spook", his artwork, carefully watches.